Baking bread at home has always been on my must-do-list. Its of course much easier to go to a Daily Breads outlet next door and buy a packet of bread from their range of breads. But nothing can beat the high you get when you bake at home, with the luxury of adding ingredients, changing the flavors and creating your own bakes. This is what I love most about baking. The list of things you can do is endless...Well.. for example, you don't get a Orange and Chocolate Marble Cake or a Nutty Pineapple Cake (without the overdose of pineapple essence) at a store. And a whole lot of things for that matter. The power of baking powder is such!! Yaaaayyy!! With a lot of expectations and some amount of hesitation, I baked bread for the first time ever. I drooled over this recipe I saw on Aparna's blog. The lady sure has an awesome awesome collection of recipes, specially bakes. It looked easy enough with easily available common ingredients. Well, not all that easy(unless you have enough experience in baking breads) as I found out later as my bread went - Oooooppps!!!! This is Aparna's recipe. I probably substituted one integral ingredient, the paneer,(apart from adequate proving probably)which might have yielded the perfect bread. Sigh!! Add the yeast and honey to the milk, stir well and allow the yeast to proof. Take the dough out of the processor bowl and knead a couple of times, by hand. ( I think I kneaded more) Form the dough into a ball and place in an oiled bowl. Cover and allow to rise till double in volume. I allowed the dough to prove for about 3 hours in my OTG(turned off of course)My dough did increase in volume, almost double. Maybe I should have given it more time, overnight perhaps?? Gently deflate the dough and divide into 6. My baking tray is quite small so I used my loaf tin to make a loaf. Allow to rise a little, for about 20 minutes. Bake at 180C for 30 minutes or till the rolls have browned. Brush with melted butter and allow to cool. I baked for more than 40-45 minutes, but the bread refused to look anywhere as inviting or soft or light as Aparna's:-((. I tried the skewer test and the bread passed. Psst... does this hold good for breads?? Well, when I sliced the warm bread, it smelled great, but only a portion of the top crust had browned. The bread was slightly undone too:-((((( My kids still ate the bread and said it tasted 'nice', which it did. Not satisfied with the heavy bread, I cut it up into small squares, baked them till crisp. Tossed them in some olive oil, chilli flakes and oregano. And then it tasted a little better than 'nice'. 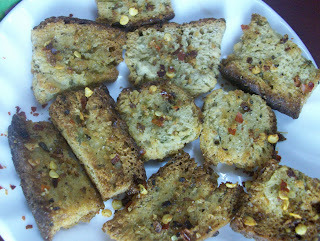 The spicy 'biscuits' went along very well with my coffee and it was effort not gone all waste after all. I am of course gonna try this out again(summer a great time I guess). Gotta learn to bake some decent bread if not extra-ordinary!!! To lengthen my already lengthy post , I have a few queries. 1. How frothy should the dissolved yeast become? Is it OK to leave it for longer than specified once it becomes frothy? 2. If a recipe says prove for 2-3 hours, is it OK to prove it overnight? Does it affect the texture and taste a lot in this case? 3.If substituting ingredients, to what extent and what ingredients can be safely substituted? 4. How much of kneading is 'adequate'? 5. What's the test for 'done-ness' of bread? AFter baking a couple of breads, i have got the hang of it and now i have tried out this recipe - I have used just grated cheese cubes for the filling and mixed the dry herbs and jeera and ajwain in the bread flour. It has come out very well. This is the link for that technique for braiding and also a good blog to follow. Thanks a lot Indrani! You bet am gonna try this out. Would love to see the pics of your bread. Could not find the link of your blog or mail ID. Please provide if OK with you. 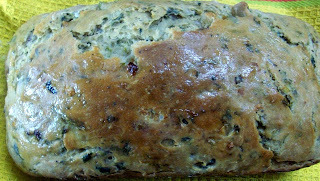 I never tried this, its marvellous to bake our own bread...thanks for sharing..this goes to my must try list. My emaid id is: indranikona@yahoo.co.in. I would love to share the pics with you. Can you also pls let me know where we get cake decorations in bangalore (name of the shop and the area). By cake decorations i mean- pearls, sugar flowers etc. Hey Suma, that was a good attempt at making bread. Baking breads can take longer than an hr as it's denser than cakes. Infact mine has even taken close to 1 1/2 hrs. So I refrain from baking a big batches. Why not start with basic buns or may be even a pizza base? That will help you for sure. The procedure followed by you seems perfect and seems well done too. Good job! first of all congrats on the attempt, i am too yet to attempt a bread...its a terrific job dear!! Gr8 attempt Suma... Ur Bread looks perfect. I still need to gain expertise in this yet !! Bread looks good. Yeast has to be mixed with warm water ,just one stir only if you stir too much it is not good. 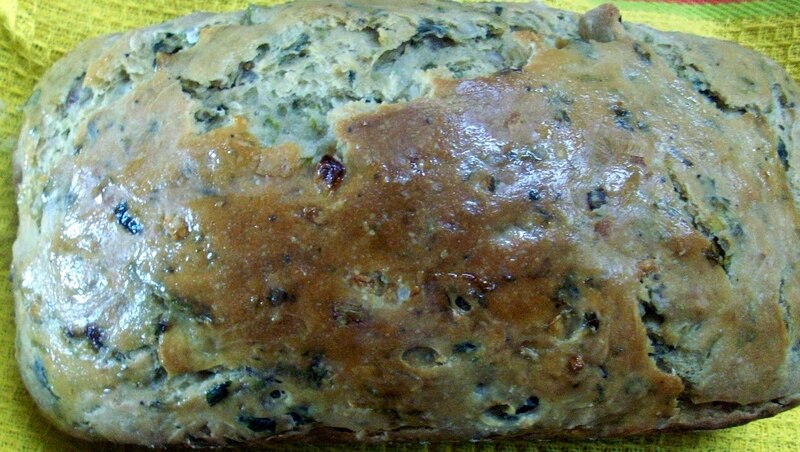 To know the doneness use the tooth pick method , if it comes out clean the bread is baked[like we do with the cakes].It is always good to use bread flour than regular Maida. The bread flour gives it the texture.Hope these tips helps. Honestly, Suma!! I LOVE the pic you have posted. Makes me wanna grab the loaf right outta my screen!! 2. My husband and I realized that everytime we followed a recipe for bread wrt quantity of the yeast, it always went wrong. Then we started using about 2-3 times what the recipe calls for in terms of yeast, and it improves tremendously. 3. About substituting ingredients, it depends on what you want to substitute. When it comes to butter, its usually not such a grand idea to replace it with, say, oil. You will definitely get different results. If it is eggs you want to replace, there are SEVERAL options. You can read more about those at www.egglesscooking.com. I LOVE this website, and most of the recipes I have tried from there, esp. the cakes, have turned out BETTER than great!! :0) Personally, I LOVE using pureed tofu as an egg subsitute. Works DELIGHTFULLY every time!! She says that when you pick up the loaf, you shud be able to tap the bottom and hear a hollow sound. Hope some of this info helps! !